Sparta Praha and Slavia Praha, both the higher-ranked teams in their best-of-three Junior Extraliga semifinal series, each dropped the first games on the road, and now must sweep at home to advance to the finals. Tuesday against Sparta. 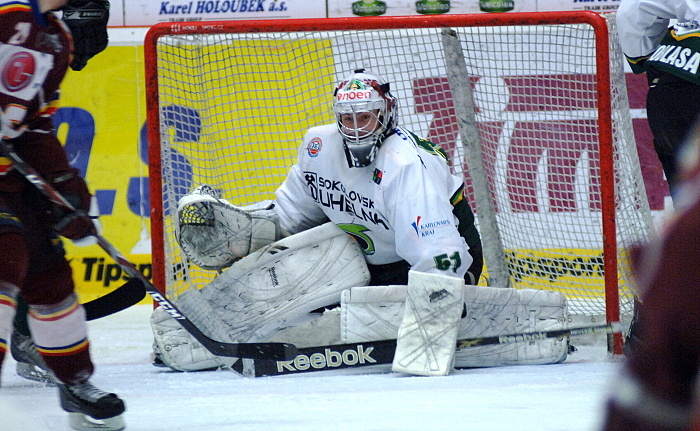 Photo: Jan Čech, Karlovarský deník. Both first games were played on Tuesday. In Karlovy Vary, the Engergie junior team beat Sparta 3-2 in overtime, when Tomáš Klíma scored his second goal of the game. As he has done the entire season, goaltender Vladislav Habal was the team's saviour, stopping 47 of 49 shots. Meanwhile, in Znojmo, the hometown Eagles beat Slavia 5-2 before an enthusiastic gathering of 817 fans. Orli was totally dominant in the game, outshooting the visitors 54-26. Both Prague teams will now try to get back on track at home. Sparta and Karlovy Vary play the second game of their series on Wednesday night, due to the unavailability of Tesla Arena on Thursday. The game starts at 19:00, and is actually the second half of a double-header, as Sparta's U18 team hosts Olomouc in an Extraliga Starší Dorost playoff game at 15:30. If Sparta wins the junior game, the third and decisive game of that series will be played Friday afternoon at 13:45. Slavia and Znojmo play their second game at Zimní stadion Eden Thursday night at 18:00. If Slavia wins, a decisive third game will be played Friday at 15:30.